Oct 10, 2016 /1 Comment/in Body language, Radio Interviews /by Patrick Wanis Ph.D.
Donald Trump was looming, stalking, prowling, threatening, hunting, intimidating and menacing Hilary Clinton as he moved around in front of the cameras rather than sitting on his chair. “Take a seat, loser!” was the front page headline in the New York Daily News, next to a picture of Donald Trump clutching the back of his seat. Donald Trump was accused of “menacingly stalking” Hillary Clinton on stage at the second Presidential Debate. 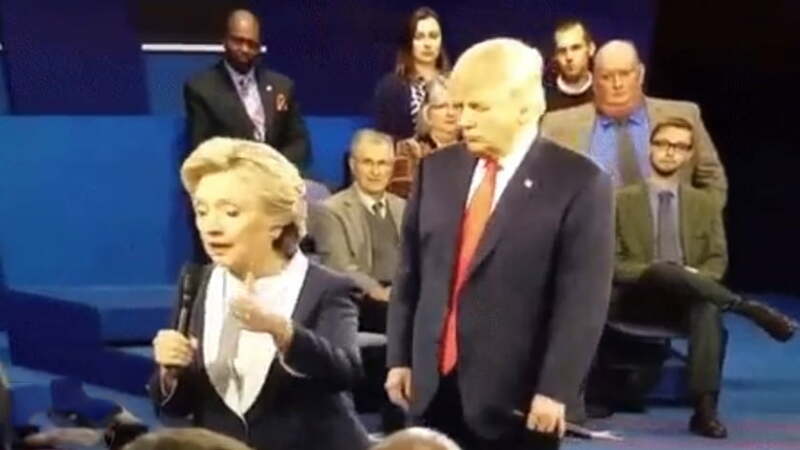 At one point he stood right over Clinton; at another point, Trump was thrusting the back of a chair, and at another he was walking away from the debate. Second US Presidential Debate – Body Language Analysis – Donald Trump deliberately prowls around the stage and gives Hilary Clinton looks that suggest his power, dominance and distrust of her. This approach suggests he was coached to go on the offensive, attack Clinton and portray her as “the Devil” before he used those words to her. Second US Presidential Debate – Body Language Analysis – Donald Trump is scolding Hilary Clinton for deleting emails, ans she glances down and gestures arrogance suggesting she is smarter and mocking Trump. Second US Presidential Debate – Body Language Analysis – Hilary Clinton speaks while Donald Trump paces away from the stage and circles numerous times in a gesture that suggests nervousness and a desire to escape. Trump gets bored easily when he is not fully engaged or the center of attention.